The role of women is clear in the New Testament. For example, Phoebe was a deaconess helping St. Paul (Rom 16:1-2). Priscilla and her husband Aquila welcomed Apollos and explained to him the way of the Lord; this was evangelism (Acts 18:26). St. Thecla was a deaconess and disciple of St. Paul, who assigned her to serve in her original homeland. She spent all her life in service and faced many tribulations and torture, but the Lord saved her every time. 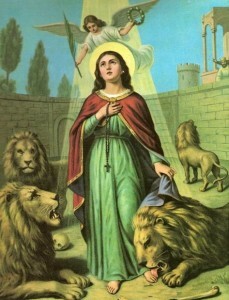 The Coptic Church commemorates her on the 23rd of Thoout. The service of consecrated deaconesses in church was abolished in the 13th century. Due to the urgent need for the service of women in church, His Holiness Pope Shenouda III decided to revive this rite on the Feast of Pentecost in 1981, by consecrating a large number of deaconesses to serve in churches in Cairo. Even earlier than that during the time of His Holiness Pope Kyrillos VI, His Grace Bishop Athanasius had begun consecrating women as “serving nuns.” Today many bishops have consecrated sisters for the service within their dioceses. She can work and serve in various church social services, such as serving widows, needy and poor.